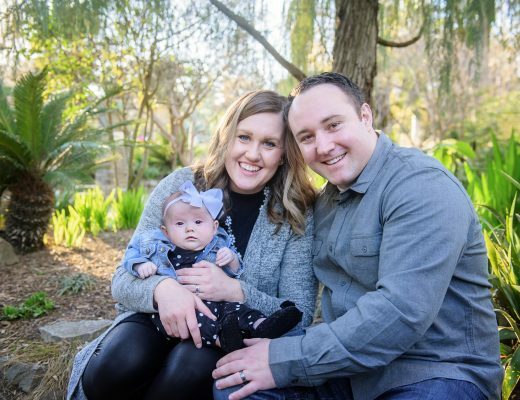 We’re halfway through January and if you’re like me, you set some goals for 2019 to start the year off. Research shows that 80% of resolutions fail by mid-February… let’s not be a part of that percentage. Who has made it a goal this year to be more organized? I don’t know about you, but I LOVE an organized home! When “everything has a home” that’s the way it should be… I’m sure it drives my hubby crazy at times (I love you babe). 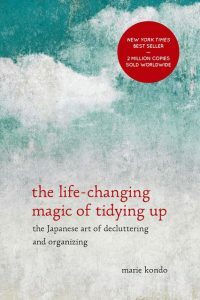 A new and binge-worthy show, “Tidying Up” (Netflix), has inspired me, even more than when I read Marie’s book, “The Life -Changing Magic of Tidying Up.” After I read the book, I went to work. Our home got organized and was very tidy, but it didn’t last for long. Seeing Marie in action gives “Tidying Up” a whole new look. As you watch the show, her personality rubs off and has me excited to give it a go once more. So it’s time I go for it…again! I’ll just imagine Marie being with me and helping me decide if my things “bring me joy or not”, and actually “thank my belongings” before I get rid of them. Not only will I be turning to Marie Kondo, but I am leaning on some of my good friends for their ideas of what they use to be organized. They’re a few kids ahead of me, so they’ve had a lot of practice and know what works best. Here’s a taste of what they’re doing of which I’ll be incorporating in my home, but with my own twists. I know that not everyone has these same rooms, but it can give you an idea of how to break things down by month. Focusing on one or two rooms a month is such a great idea. You don’t feel as overwhelmed when you know you should only be focusing on a specific room, rather than all the rooms in your home. The things that she has already done with the play room is top notch and I can’t wait to see how she also teaches her kids the system so everything continues to stay organized. Next, is my friend Marci. You can find her over at The Wallace House. 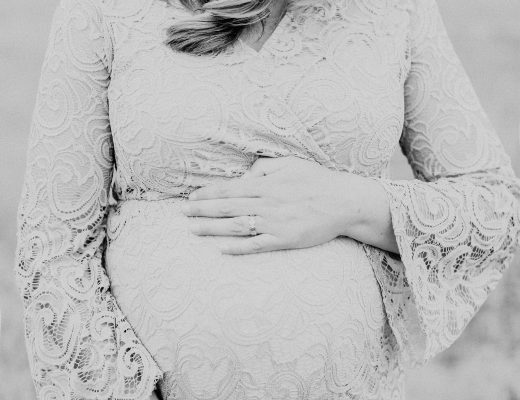 She is an amazing mother of four (soon to be five) of the cutest kids! Last year she focused on purging and has done an amazing job at it too! 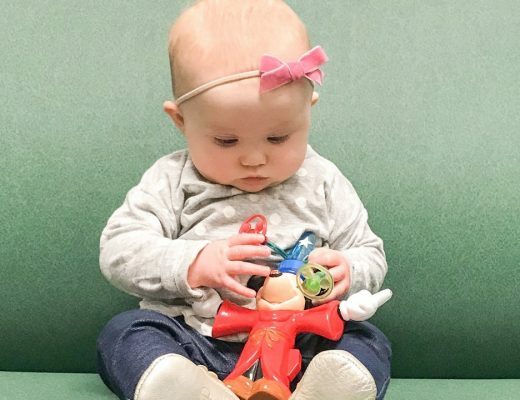 She has created an organized home and her organization of toys with her kids is absolutely incredible. 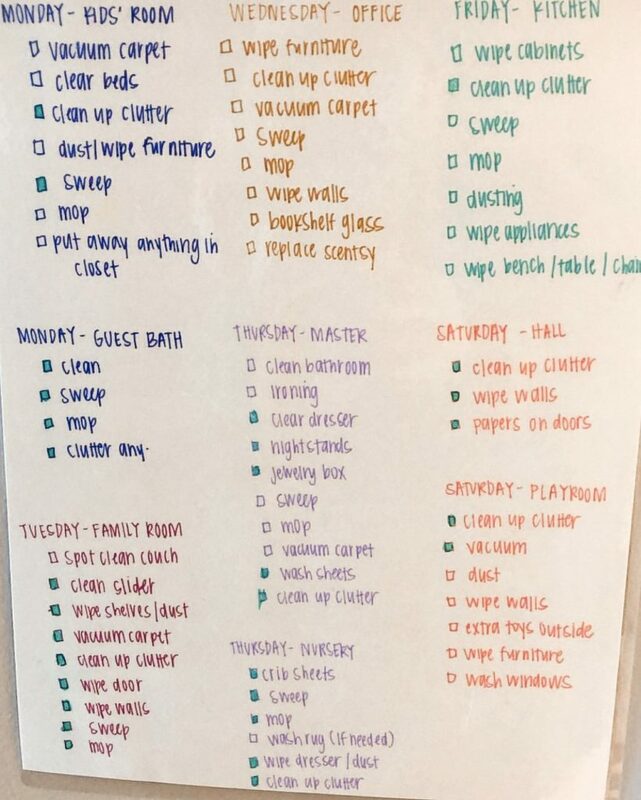 Also, if you like checking things off on a list, she has a way for you to keep up with your weekly and monthly household chores. Take a look at her list — then create your own, tape it up, and get to work! Sit down and make a plan. 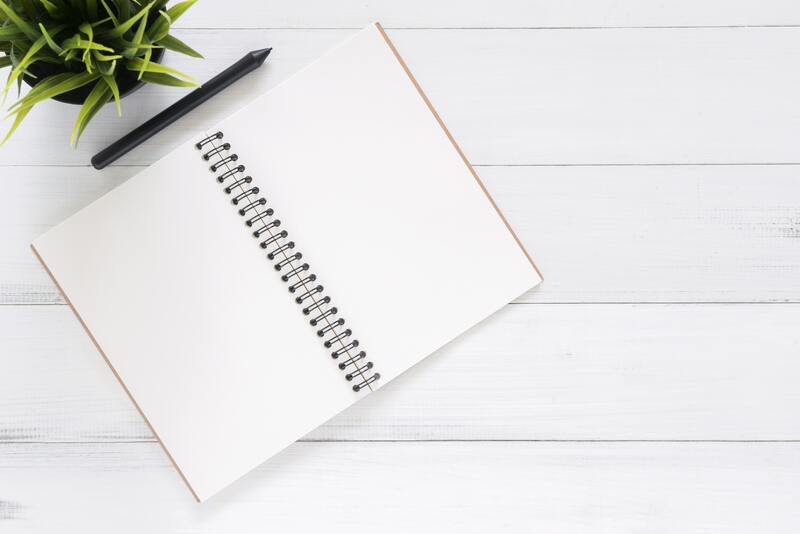 Write down your “To-Do List” and use that as you go through organizing your home. Be specific in what you’re going to do. If lists encourage you, write down every little thing (you’ll have even more to cross off)! Don’t do it all at once. Take your time and break it down into rooms or specific categories. Be kind to yourself and enjoy the process too. Find a system that works for you. Don’t try and do something if it doesn’t feel like its going to stick. You be You! Find joy in organizing. If what you’re doing to organize is driving you nuts, stop. Take a break and come back and try again. You don’t have to go and spend a ton of money to get things organized. Go and buy all the amazing organizing things at The Container Store or you can go find something that works from The Dollar Tree. There is a price difference, but they both work. These are containers that I have and use all over my house. Only $1…so if you’re on a tight budget this can work great for you! Once we’re in our next home, I plan on using the Kuggis Box from IKEA. It comes in so many different sizes and lids. Plus, you can’t go wrong with the organization systems that IKEA has to offer. There you have it. My organizing is going to be a process this year, but I’m excited to tackle it. Good luck this year with all your resolutions. Don’t be too hard on yourself and don’t forget to Enjoy the Journey!